Fed cattle market: In like a lion and out like a lamb? Cattle feeders have been able to push the market to seasonal highs. Is there more to come or have we set the highs for the year? The spring rally is on! Cattle feeders managed to jump the market to $124-125 per cwt at the end of February. The surge followed several weeks of the market being caught in a sideways chop with fed cattle bringing mostly $119-120. But packers chased after cattle on the heels of stronger wholesale beef prices in late February. Better yet, March opened with solid follow-through at steady to slightly better prices. Meanwhile, action at the CME, at least on the front end, has also been positive. For some context, the April Live Cattle contract traded above $120 in the second half of January. From there though the April contract, it retreated all the way back to $112 by mid-February. However, the rally of late managed to pull April, the new front-end contract, back to $117 by month’s end. Now the question becomes whether or not the spring highs are in for 2017. That is, will February’s $125 be the high point as we work through the rest of the spring – or is there some dry powder left for the market going into April and May? Obviously, that remains to be seen. However, there’s reason for optimism. Primarily, cattle feeders have been aggressive marketers and are working with a current front-end supply. 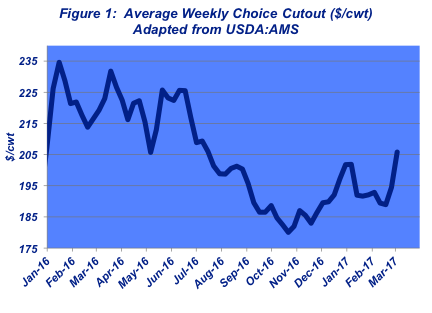 USDA’s Cattle on Feed report indicates the 120-plus day inventory equaled only 3.24 million head as of February 1; that’s nearly 570,000 head fewer than last year – and only 179,000 bigger than 2014. Active sales in recent months have provided feedyards some buffer amidst weekly negotiations for the foreseeable future. The real driver, though, for the fed market in coming months resides on the beef side. That, too, has shown some signs of life in recent weeks with the cutout finally garnering some traction in February. Aside from a post-Christmas blip, the comprehensive cutout has chugged along since last summer, the last time it scored above $205 (Figure 1). But better prices of late are a positive signal with respect to beef demand. And in light of solid consumer sentiment about the economy (see this week’s Industry At A Glance), there’s general hope that demand can be sustained through the spring. But then again, with any outlook, there’s always a flipside. What about the downside risk that remains with the market? As highlighted last month, the non-commercial (speculator) position has remained sizeable thus far in 2017. That’s largely the result of favorable trader sentiment in the financial markets since the election. Confidence about the general direction of the economy has provided support for the cattle contracts, thereby also giving producers some fortuitous hedging opportunities along the way. Assessing the market further down the road is obviously more difficult. However, the summer market could prove to on the defensive due to supply concerns as we transition into June and July. 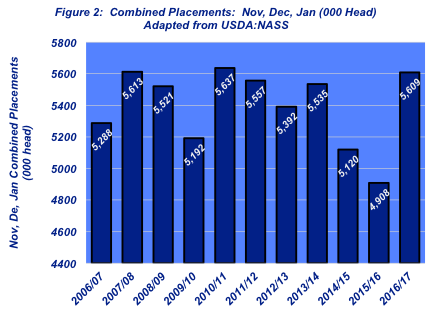 USDA’s February Cattle on Feed report revealed that feedyard arrivals in January equaled 1.98 million head – 202,000 head or 11% higher versus 2016. More importantly, combined placements during November, December and January have totaled 5.62 million head – 711,000 bigger versus the same months in 2015/16 (Figure 2). Therefore, on the other end, that means bigger kills have to happen in May, June, July to stay current. That said, any sort of uncertainty or negative signal could and likely would have the non-commercials looking for the exits. That would be especially detrimental to the already-discounted deferred contracts. As noted last month, the current rally underscores the importance of getting at least partial price protection at these levels. From a broader perspective around the beef business, I recently had opportunity to speak at the Virginia State Feed Association Annual Convention. The talk was titled, “The Beef Industry: Navigating a Rapidly Changing Business Environment.” To that end, I worked through several key themes I believe most important to producers: shrinking revenue; market volatility, and policy. In preparation, I reviewed a presentation made at Kansas State University eight years ago as the Obama Administration was coming into office. The three themes match what I covered back in 2009 amidst the throes of a financial crisis and a new president. The point being, we find ourselves in a generally familiar spot. The overarching concepts revolve around challenge and uncertainty. Those seem to never go away. Within that broader context, the primary question I pose to producers is, “How will you will respond under market and/or financial pressure?” The answer varies greatly depending upon one’s individual risk profile as dictated by debt, age, other ventures, etc. The critical aspect is to know yourself when faced with challenge. Accordingly, I always encourage producers to NOT listen to others! There is no one operation like another. Every operation possesses unique characteristics, making it distinct from any other operation. And within that, I emphasize an astute observation from Howard Marks, Oaktree Capital Management: “In short, people make each other crazy. And when times are bad…they depress each other.” In other words, avoid the coffee-shop talk. With that in mind, it’s worthy of repeating every month: producers should ensure they have access to objective information that’s pertinent to their operations. That information should be filtered and reviewed with careful analysis, thereby increasing the likelihood of utilizing it to make good business decisions going forward.